Most parents will agree that there are lots of advantages to children playing and participating in summer sports. What most parents might not realize is how important of a role they play in their children’s sports. There are several roles a parent plays in relation to team sports, and being a good role model at all times is probably the most important one of all. Below are five excellent ways that you can support your kid’s summer sports teams. You want to be a good sport at all times for your team. Root them on during their games, and clap and cheer for them. Show up to all the games your child plays. If you have no way to make a game, have someone tape it, and talk to your child about why you cannot go. Always show an interest in your kid’s games, practices and other summer events. When it comes to the opposite team, remember your attitude. Never say anything bad about the coach or players on the other team. If there is a true problem, the adults can work that out alone. Never accuse the other team of cheating or say bad things about that team around your child. You need to show your child what it is like to be a good sport, whether you win or lose. Never gloat in front of your child about winning a game. Always give the “good game” handshake to the opposite team. Another way to show support for the team is by showing up on time for all games and practices. All the team members’ and coaches count on your child to show up on time, and it is your responsibility to show everyone that you are just as dedicated as your child is. Always discourage your child from bullying another teammate or opposite team member. Teach your child how to be a kind, confident teammate. This is something your child will keep with them for the rest of their lives, whether it is in sports or outside of sports. Some very well-meaning parents have a problem with taking the sports game far too seriously. Ultimately, sports are about the health and fun benefits for the child and not the big win for the parent. All proud parents want their kids to win, but these good intentions can easily get out of hand if we let them. A parent who argues with a ref or coach is showing their child poor sportsmanship. 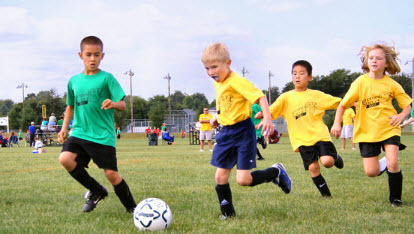 Being involved in summer sports is a very healthy activity for kids of all ages. Even a child who does not feel talented enough to play sports should give them a try. With the support of the parents, children will develop good, lifelong relationships with sports.